Parents, we all want our children to read. 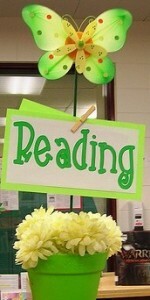 More importantly though, we want our children to want to read. The easiest way to do this is to read with our kids every day (so sayith every teacher and research study worth their salt). In fact, it’s so common sense to nurture a love of reading by reading with your child that it’s cliche. And yet, there’s more to this than meets the eye. 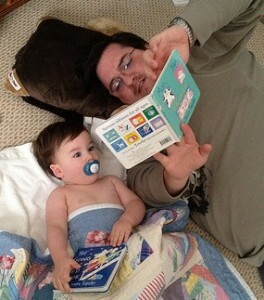 How do you actually read with your child? This is an important question. There are ways of reading that are dry and passive, and then there are ways of reading that engage kids’ minds and imaginations. The latter is infinitely more fun and enriching. Ask Questions. This is by far the most important thing we can do when reading with children. Kids crave interaction, and asking them questions around a story is the best way to help them actively engage with you and the book’s characters, ideas & circumstances. This is called ‘Dialogic Reading’ because it creates an active dialogue that helps your child become a teller of the story, not just a passive listener. –>Tip: My favorite kinds of questions are CROWD questions (Completion, Recall, Open-ended prompts, Wh- & Distancing). 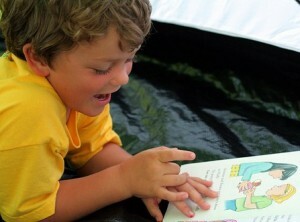 Read a fantastic article that explains Dialogic Reading & CROWD questions in more depth here. Add Your Own Style. Play with making up funny voices for characters. It may feel silly at first, but that’s only because it is. It’s also fantastic fun, and your child will love it. Act things out, make up rhymes, give personality to the story. Be creative! 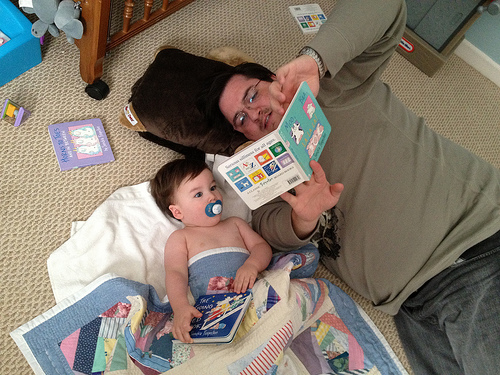 –>Tip: When someone knocks on a door in a story, knock on the book with your little one. When there are pictures of different kinds of food, pretend to smell/eat it off the page. Little tricks like this involve movement, imagination, and help bring the story to life. Do Activities Based On Books. Think ahead & plan a craft, field trip or experience that expands the topic of what you read. 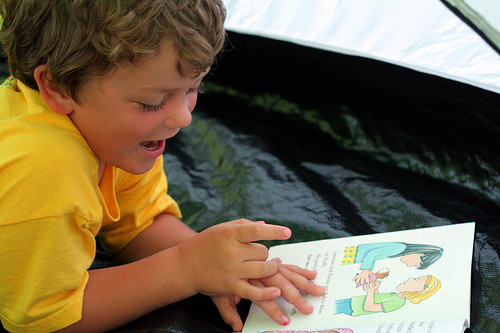 This will nurture your child’s interest in stories and learning, show them how to make connections between books and the rest of their lives, and reinforce positive associations between reading, learning and spending time with YOU. –>Tip: Crafts can include puppets, paintings, masks/costumes, recycled material creations, etc. Field trips & experiences? If you read about dinosaurs, check out a natural history museum! Do a local scavenger hunt, act out the story, incorporate music, read inside of a fort, create a scene using blocks or Legos, put on a puppet show – you get the idea. How we read with children makes a difference. 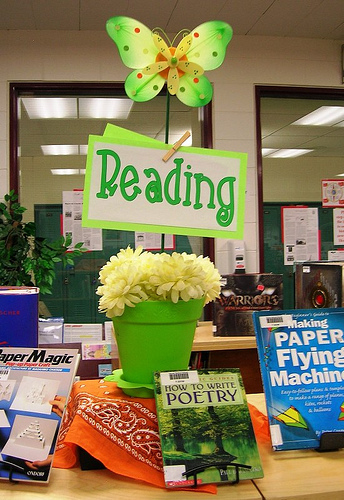 To truly get kids hooked on reading, we want them to associate it with interaction, dialogue, and fun experiences. We have to be interested. We have to have fun. We have to be hooked ourselves. 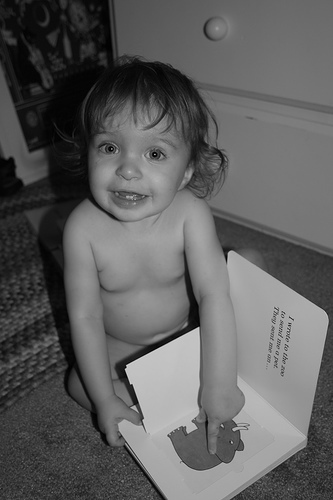 What do you do to help your child fall in love with reading? Share your stories here!